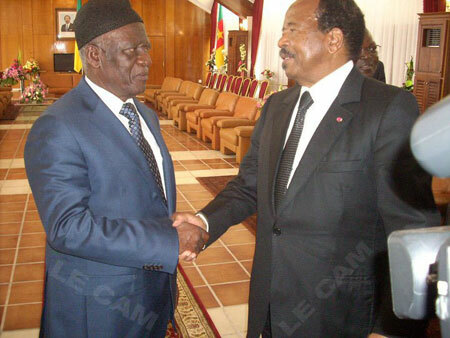 On Friday, December 10, 2010, the two chief shakers and movers of Cameroon politics, President of the Republic, Paul Biya, and opposition leader, John Fru Ndi, met in the Bamenda Up-station presidential residence, after the celebration of the 50th Anniversary of the Cameroon Armed Forces. The Post: The long-awaited historic meeting between you and the President of the Republic finally took place today. How did it go? Fru Ndi: As you rightly say, it was long awaited – 20 years plus. But the good news is that we finally met and we started dialoguing and by the time we rounded up we agreed that we will continue with the dialogue because we realised that information was not flowing between the two of us. May be there was a blockage somewhere. I say this because, during our discussion, Biya still came back to the interview he granted in France some years ago saying he sent word that we meet and I replied that I was only prepared to meet him in Mvomeka which was not true. I reminded him that word never reached me about any such meeting and that I would want to know through whom he sent the invitation for us to meet. If you were asked to describe the atmosphere of the encounter, how would you say it was? It was serene, cordial and relaxed. Who were the members of your delegation? The members of my delegation, I must stress, sat out. They comprised Parliamentarians, the Secretary General of the party, the Vice President of the Assembly, the Parliamentary Group leader and some NEC members. 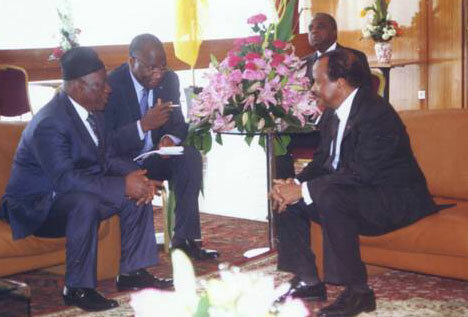 I had this meeting on a one-to-one with Mr. Biya. Did you have the impression that it was a genuine discussion or just a political gimmick to placate Cameroonians who have wanted this encounter to take place? Well, you cannot assess at this point whether it was genuine or talking heart-to-heart. It will only be after some time that you will see whether some of the things that we discussed are being executed or not. It is only then that you can say whether there was display of good faith or not. Which are some of the topics you discussed? For now, what pre-occupies the SDF and Cameroonians is the electoral system. We are for free, fair, transparent elections. That is why I told Biya that ELECAM is not working well. I told Mr. Biya that I have proof of people carrying out multiple registrations. I said if he thinks that we should sit down and tackle this issue of ELECAM and either solve the problems plaguing it or improve on ELECAM that will be the beginning of talking and walking together. By working together, does it insinuate power sharing? Our working together would be to ensure that the laws governing elections in Cameroon are put in place. If you talk about power sharing, it might interest you to know that we are Social Democrats while the CPDM camp might not look at things with the same lenses we are using and might not approach things from our angle. You will recall that they called us a couple of years ago about this power sharing thing. We sent our delegation to talk with them only to discover that they were just trying to trap us to join government as they did to Minister Bello Bouba Maigari. When we realised this, we called off the talks. What did Paul Biya himself tell you? He said we had started talking and we would continue. Did Biya’s guards search you before you met him? I was not searched at all. If there was any search, it was when we were going to the grandstand the other day for the military march. Everybody was searched and if there was one person who was not searched, it could be Biya himself. What have you come home with from that particular meeting; one memorable thing that you can tell Cameroonians that you carried home? I think I have come home with the notion that some people, somewhere, somehow, have been trying to block dialogue between us and that this myth is broken and from now, henceforth, we will be meeting to discuss issues affecting this country. To quote Biya, he said people will go but Cameroon will remain. So, I pointed out to him that, that is the more reason why the SDF believes that we must put in place institutions that will last – not cosmetic institutions. Was your meeting provoked by the fact that you boycotted the military display at the Bamenda-Bafut Airport and the lunch he offered the military where you were not one of the invited dignitaries? I was not invited for the airport programme with the military. What pre-occupied us is the future of Cameroon. When I met Biya, I thanked God for the successful military celebrations. I also thanked him for having spent an additional day in Bamenda. This, I told Biya, would tell the world that he was at home and felt much relaxed. As such, I requested that he should stay another day so that we could take lunch together. He replied that he would find time and come back. Which of the official languages did you use during this dialogue? We spoke in English and French and there was a translator. But I must confess here that Biya beat me on the language issue. That is, he spoke quite some English more than the French that I could speak to match up his level. Were there light-hearted moments when the two of you broke into laugher? Oh, there were quite a couple of times we laughed on interesting issues! You said his level of bilingualism was far above your level. Are you going to resume classes in the French language? I will come back to the press when I will start classes in French. One has the impression that you talked only about ELECAM with Biya. What were the other issues you discussed and did you hand any memo to Biya? I handed a memo to the President and it is not appropriate for me to disclose the content to the press now. But, if you have been following up SDF debates from NEC, you can guess the content of such a memo I handed to Biya. Can we suggest that this meeting is the beginning of "soya eating"? Well, it’s you journalists who eat ‘soya’. I have never gone in for soya. What I have stood for all along is what is in the interest of the Cameroonian people. After our meeting today in public, those who claimed to be insiders and went around drumming their chests and telling lies how Fru Ndi had been wining and dining with Biya will be put to shame. Before today, you told the press that, you had prepared to offer him breakfast and lunch at Ntarinkon. This indicated that you had put together quite some resources to receive him. Did he, out of sympathy for what you must have spent, hand over an envelope to you to defray the costs that you must have incurred? I’ll refer you to Biya. Ask him whether he gave me anything at all. If tomorrow Biya sends a bodyguard and other privileges you were supposed to have as a leading opposition leader, will you take the offer? During our discussion, I raised the statute of the opposition in Cameroon. He retorted that he was going to look into that. If he does and gives my own privileges as they give to parliamentarians, I will not say no. But, mind you, that will not make me to compromise my position and that of the party. We will still be out on the streets to challenge any wrong-doing by the government, calling on it to sit up and do the right thing. Are you envisaging reminding Mr. Biya about further meetings, as agreed, when you don’t hear from him soon? Yes. On ELECAM, on electoral issues, on socio-economic, cultural and other issues, I will continue to remind him of those things that are not moving on well. Traditionally, the Northwesterner receives guests with some little gifts. Did you give Mr. Biya any gift? I did not take any gift, for this is my first time meeting him. Neither did he give me any gift! Now that we have met, next time I will offer him a gift and I believe he, too, could offer me one. I separated with Biya on assurances that we will continue to meet to look into issues in detail. You will agree that forty-five minutes weren’t enough to discuss issues that have taken place over 20 years and more.